It seems that Oberlo will not automatically include the ePacket shipping price into the product cost, or am I mistaken? If we manually add the ePacket shipping price into the products selling price on Shopify, and if we do so, will we have to turn off Oberlo auto price update for this product? You're right. We suggest starting with a free ePacket option so you don't have to adjust your prices individually for each product. If you adjust your prices manually, I'd recommend using price updates notification instead of automated price updates. Or just make the price multiplier higher so it covers the ePacket expenses too. Thanks for the quick answer Tomas. Can you explain a bit further about starting with a free ePacket option? How does that work? With our free Chrome Extension, you can browse AliExpress category page and filter out products that don't have ePacket delivery option. It also identifies the ePacket price to a selected destination country. Screenshot below. Browse the AliExpress using these filters and look for products that has a free ePacket delivery option. 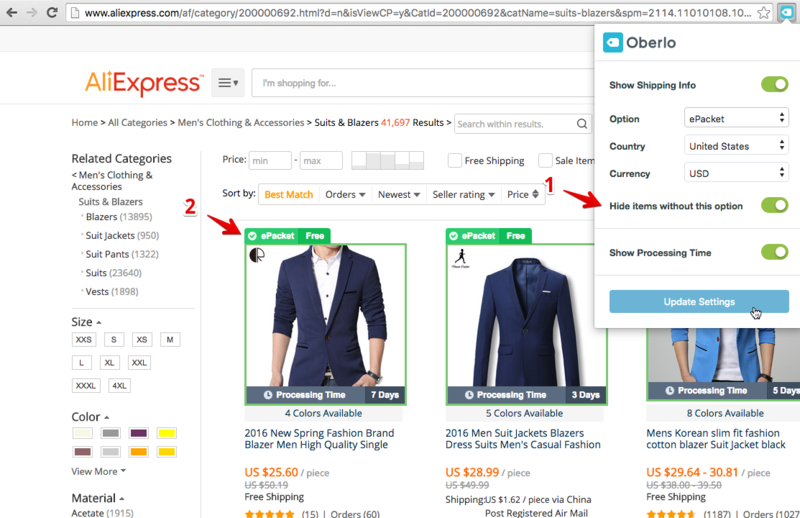 If someone orders from my store and i have oberlo, does this mean the order is then automatically fulfilled by oberlo providing i am using aliexpress? Thanks Tomas, that is a really handy feature indeed. EfE I'm finding it an issue too. Some products I would make a loss on after epacket postage to some countries. I could increase the price by x3 to be 100% sure I'll make a profit but then it's the same or more expensive than here in the U.K. So why would anyone buy from china?? It would be really helpful if the epacket cost were added to the price. I have a mix of free epacket and non free epacket. What I have seen for my products & suppliers that the additional epacket cost ranges anywhere from 1.42 and up to 3 on average. I use the advanced global pricing rules option in oberlo and price my products based on my expected profit + shipping + product cost. Example product cost = 2.99 + $3(Shipping) + $10 (My set profit) = List Price is $15.99. I have set marks up in the Advanced pricing rules under Global pricing that include shipping cost in the total cost of the product the my customer see's. So if a product cost between $2-$3 the set mark up is $13 dollars even if its a free epacket. This was the easiest way I for me to automate my pricing structure. Tomas is currently away so I'll jump in the conversation. That's not quite right - Oberlo does not order products from the supplier. Here's how the whole process works: when a customer places an order in your Shopify store and you receive money to your payment gateway account (PayPal for example), you then have to use your personal credit card and purchase an item for your customer from the supplier, to be shipped directly to your customer. Let us know if you need further clarification! Hi all, you are right oberlo automatically changes the price of the products too, so if you have shipping costs its not included in the price and you wind up paying from your own pocket in many cases. THIS IS A SCAM why ? because shipping costs are not included and even if you change your global pricing rules oberlo rises up the prices of the product leaving you no profit at all (not only that) you pay from your own pocket in LOSS to fulfill the orders. Oberlo never promises to add in shipping costs. We can't! Shipping prices can change depending on what country you are shipping to. All our help documents, including Setting up Shipping in Oberlo explicitly say that we can not add in shipping. Rather, we outline how to add shipping in Shopify or average out the shipping cost and add it into your markup. In the future, feel free to ask our support or read any of our help documents to get some context. Hi, we where just wondering if that is true. You actually should be able to set up an automated variable for each country called Country or something like that. And then the formula for the real Profit would be Your Store Cost - (Product Cost + Product Country Shipping Cost). The Product Country Shipping Cost should be perfect in the min but you could actually make it to be different for each country since there could be multiple shipping options (this would take longer to develop we know). It would take quite longer to add Each product to the shop but it would be totally worth it and safer for each shop and less stress for everyone. Its quite clear that this would make the Global Pricing Rules better for sure because right now its like having something half way done. Thx anyway i wish you get the idea done. Hey Gymbay I really appreciate you listing out how to get this done. I should clarify, it's not that it's impossible, it's that we currently can't. Our developers are working diligently, but have not gotten to this just yet. I really appreciate your patience, and the day I can share the new update!